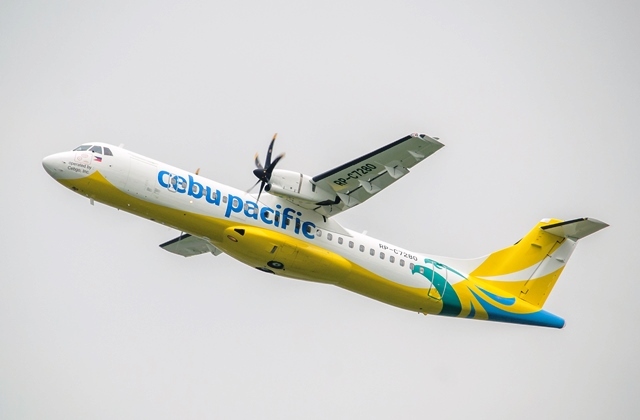 Aviation Updates Philippines - The Philippines' leading airline, Cebu Pacific (PSE: CEB), adds five new routes to its inter-regional network, connecting more islands from Mindanao to Visayas to the rest of the archipelago. The new routes stem from requests from stakeholders, particularly in Mindanao, to improve connectivity of key cities. VISMIN NETWORK EXPANSION. These new routes will connect more points in Visayas and Mindanao. The announcement came a week after President Rodrigo Duterte declared Martial Law in the Mindanao group of islands. Photo by Cebu Pacific. Starting July 26, 2017, CEB wholly-owned subsidiary Cebgo will fly three times weekly (Monday, Wednesday, and Friday) between Cebu and Masbate, Davao and Dumaguete, and Zamboanga and Cotabato. Cebgo will also begin flying four times a week (Tuesday, Thursday, Saturday, and Saturday) between Cagayan de Oro and Zamboanga, and Davao and Tacloban on July 27, 2017. The new routes will be serviced by the Cebgo fleet of ATR aircraft. "Cebu Pacific is very pleased to continue to help promote domestic and international tourism and a logistics enabler to move goods across the country. As we expand into new routes and destinations across the Philippine archipelago, we are committed to being a partner in spurring trade and tourism; helping pump-prime the local economy and providing everyJuan with more travel options with year-round affordable fares," said Alexander Lao, President and CEO of Cebgo. CEB offers its lowest all-in one way year-round fare from Cebu to Masbate at Php1,758; from Cagayan de Oro to Zamboanga at Php1,906; from Davao to Dumaguete at Php2,590 and Davao to Tacloban at Php 2,142; and Zamboanga to Cotabato at Php1,806. "Travelling across the Philippines is easier and more convenient for everyJuan. To get from the Visayas to Mindanao and back, travellers now have more choices and need not pass through larger airports in Metro Manila or even Cebu." Year-to-date, Cebu Pacific has launched commercial operations of eight (8) new routes: Manila-Masbate; Manila and Tablas, Romblon; between Cagayan de Oro and Tagbilaran; to and from Cagayan de Oro and Bacolod; Cebu-Cotabato; Cebu-Busuanga (Coron); Clark-Busuanga (Coron); and Clark-Caticlan (Boracay). Aside from its Cebu and Davao hubs, CEB also operates flights out of four other strategically placed hubs in the country: Manila, Clark, Kalibo, and Iloilo. CEB enhances inter-island connectivity within the country and across the globe with its 66 destinations with over 100 routes, spanning Asia, Australia, the Middle East, and USA. Its wholly-owned subsidiary, Cebgo, currently offers flights to 27 Philippine destinations utilizing an exclusive fleet of eight ATR 72-500 aircraft, and five ATR 72-600 aircraft. Cebgo has two strategic hubs in the Philippines namely, the Ninoy Aquino International Airport (NAIA) Terminal 4 in Manila, and Mactan Cebu International Airport (MCIA) in Cebu.